Common Chickweed (Stellaria media) is a dicot weed in the Caryophyllaceae family. In Germany this weed first evolved resistance to Group B/2 herbicides in 2011 and infests Rapeseed, Spring Barley, and Wheat. Group B/2 herbicides are known as ALS inhibitors (Inhibition of acetolactate synthase ALS (acetohydroxyacid synthase AHAS)). Research has shown that these particular biotypes are resistant to amidosulfuron, florasulam, imazamox, iodosulfuron-methyl-sodium, mesosulfuron-methyl, nicosulfuron, pyroxsulam, thifensulfuron-methyl, tribenuron-methyl, triflusulfuron-methyl, and tritosulfuron and they may be cross-resistant to other Group B/2 herbicides. 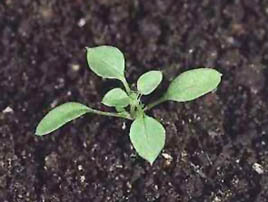 Chickweed was first reported with ALS inhibitor resistance in Germany in 2011 - to the herbicide Imazamox. Further studies have shown that a population of Chickweed in Germany is resistant to amidosulfuron, florasulam, imazamox, iodosulfuron-methyl-sodium, mesosulfuron-methyl, nicosulfuron, pyroxsulam, thifensulfuron-methyl, tribenuron-methyl, triflusulfuron-methyl, and tritosulfuron. Genetic studies on Group B/2 resistant Common Chickweed approved TSR with heterozygous SNP´s at position Pro197 and Trp574 . TSR should be the main mechanism of resistance. There is no record of differences in fitness or competitiveness of these resistant biotypes when compared to that of normal susceptible biotypes. If you have any information pertaining to the fitness of Group B/2 resistant Common Chickweed from Germany please update the database. The Herbicide Resistance Action Committee, The Weed Science Society of America, and weed scientists in Germany have been instrumental in providing you this information. Particular thanks is given to Klaus Gehring, Günter Klingenhagen, and Jan Petersen for providing detailed information.